Coming off the heels of a string of smash successes centered on talking toys, bugs, monsters, and fish, Pixar's sixth feature film was a radical departure for the always surprising computer animation house. 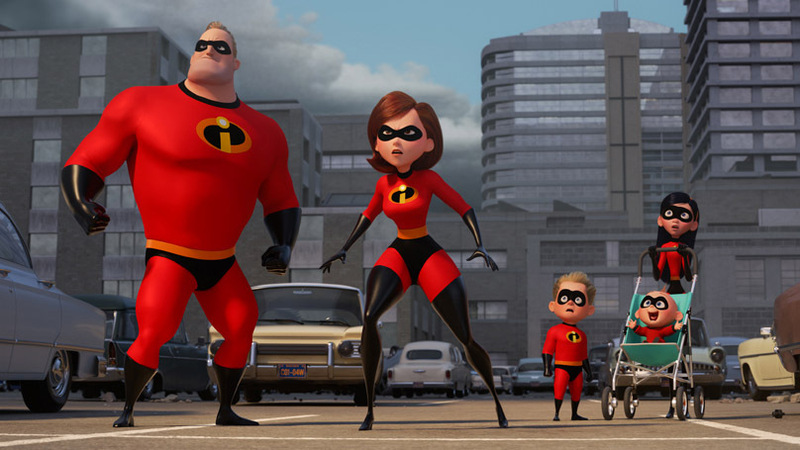 Revolving around not only human beings – who in 2004 had only ever been in the periphery of other Pixar releases up until that point – but superheroes at that, Brad Bird's The Incredibles managed the impossible task of delighting children with its fast-paced excitement as well as adults who undoubtedly appreciated the film's emphasis on family overall. 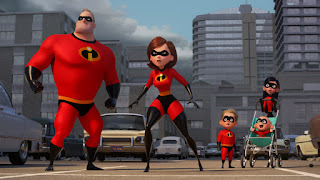 Though a focal point of other superhero fare including the Justice League, X-Men, or Avengers, which were subtextually built upon the idea of choosing your own surrogate family, Bird's Incredibles took the term "family picture" to a new literal level. And in doing so, he dared to make the ordinary extraordinary, which is the theme carried over in this 2018 sequel which picks up precisely where the previous film left off in spite of a fourteen year gap. "Done properly, parenting is a heroic act," my favorite supporting player, technical super suit designer Edna Mode (voiced by Bird) says to a stressed-out Bob Parr aka Mr. 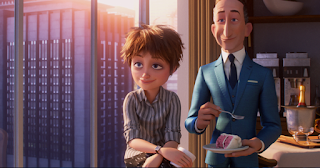 Incredible (Craig T. Nelson) in Incredibles 2. Not allowed to moonlight as a "Super" anymore, in the film, Bob experiences a role reversal with his wife Helen aka Elastigirl (Holly Hunter) after the superhero program is shut down because, as Rick Dicker (now voiced by Jonathan Banks) explains, "politicians don't understand people who do good simply because it's right." Recruited by the private sector in the form of Bob Odenkirk's telecom giant Winston Deavor who, along with his sister Evelyn (Catherine Keener) is working to "make all supers legal again," with his connections, lobbyists, and by embedding super suits with tiny cameras for a PR campaign, soon Helen is employed full-time because she causes less property damage than her Incredible spouse. Enjoying the perks of the job from a new Elasticycle to a luxurious temporary home for her loved ones since the Parrs are still in hiding since their last adventure, though initially cautious, soon the former stay-at-home Supermom falls back into the routine of her younger mohawk days, which amazingly Bird and company didn't bring to life in flashback. 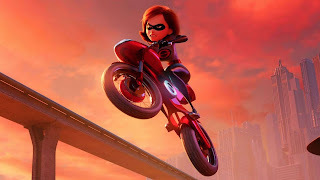 And as Bob juggles solving complex math problems for son Dash, inadvertently embarrassing daughter Violet in front of her crush, and realizing Jack-Jack's alarming and quickly out of control super powers, Helen takes center stage in the lightning paced sequel’s most impressive sequence as she races to stop a runaway hovertrain. While the action in the original feature was one of its benchmarks, following Brad Bird's work directing one of the most jaw-dropping Mission: Impossible films yet via Ghost Protocol in between the two Incredibles, Elastigirl's adrenaline pumping, highly cinematic hovertrain rescue thrills on the same level as a live action tentpole movie. 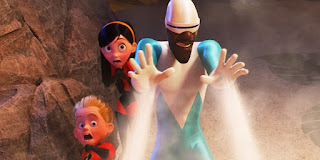 Although admittedly, one fight scene amid blinding white flashing lights later on in the film should necessitate an epilepsy warning before the film even begins – and indeed movie theaters alerted attendees during its initial run – Incredibles 2 never lets the epically executed action get in the way of its family-centric message. Working together literally and metaphorically, as the rest of the Parrs including Samuel L. Jackson's "Uncle" Lucius aka Frozone predictably jump into the picture's ultimate showdown, the film still drives home the picture's overarching theme while reinforcing the lesson of its predecessor, namely that the family of distinct individuals are – like the rest of us – stronger when united. Comprised of two Blu-rays, one DVD, and a code for a digital copy of the film, Disney Pixar fills the three disc set with a wide variety of bonus material such as behind-the-scenes featurettes, mini-docs exploring multiple characters and more, which has been the studio’s M.O. since the beginning. 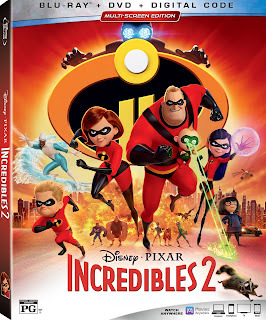 And given that the production schedule was moved up a year after Pixar flipped the release date of Incredibles 2 with Toy Story 4, some of the disc’s extras (including ten deleted scenes) hint at storylines and ideas Bird has acknowledged he had to cut for time, which cast members are hoping might pay off in a third entry. 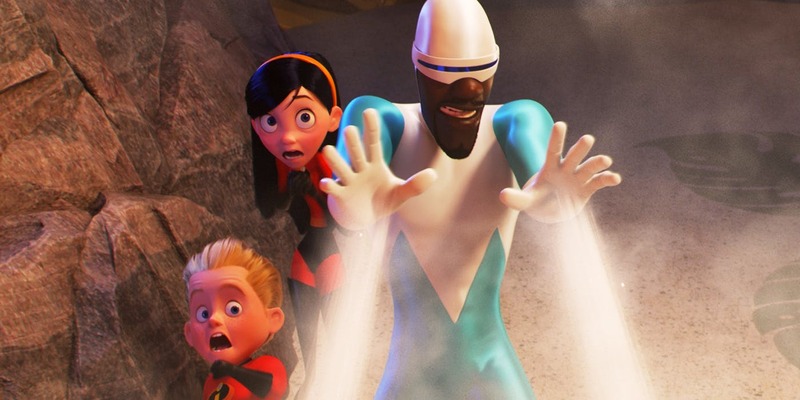 More about the people behind the quest than the quest itself, even though there are nods to previous genre favorites like Burton's Batman and Raimi's Spiderman 2, Incredibles 2 is a refreshing variation for those suffering from superhero overload. 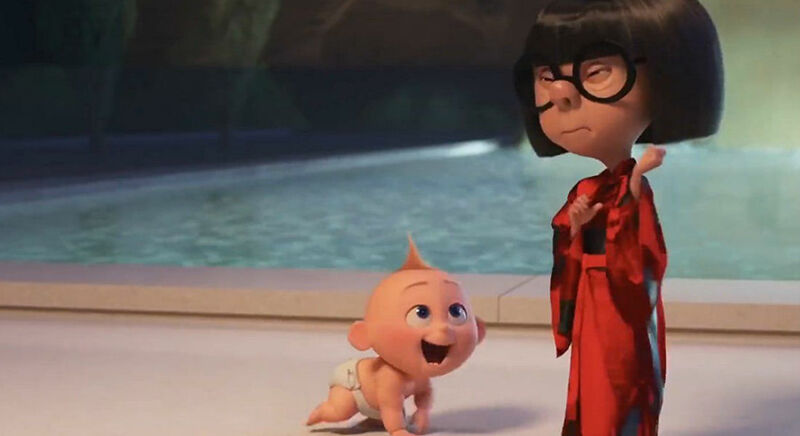 Using the opportunity of a new release to showcase another stellar short film, in addition to Bao, be sure to look for the delightful Incredibles short Auntie Edna that – fitting into the overall narrative – plays like a five-minute deleted scene and gives us a chance to see Edna and Jack-Jack in action. Amusing enough to make me think that Edna (and therefore Bird) could follow in the footsteps of Finding Nemo's Dory and have their own fabulous spin-off, even if this isn't the case, it's safe to say that with their history of Incredibly outside-the-box thinking, whatever Pixar cooks up next will be sure to blow our minds.